What’s up with the Tele? Advocates of Tele-care, and Assisted Living Technologies generally, believe they can save Scotland blowing its health budget; by enabling more older people to live independently, and so relieving pressure on hospital services. But does the reality match the hype, asks Doug Anthoney? 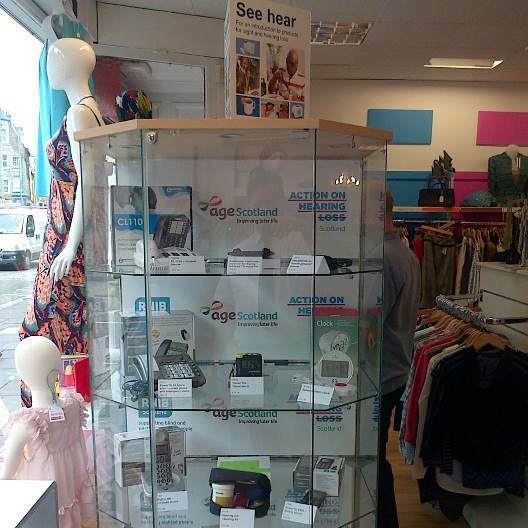 Assisted Living Technology on display at Age Scotland’s Nicolson Street Shop. The shoes are a give-away – literally. They’ve got tracking devices in the heels so that, using Global Positioning System (GPS) technology, the wearer can be traced by satellite. This made some delegates at a recent conference run by the COBALT project (Challenging Obstacles and Barriers to Assistive Living Technologies) uncomfortable. Can we be sure the wearer has consented, they asked? Is it ethical? However I also spoke to a Tele-care professional excited by the potential of a GPS pendant being piloted by her local authority. A wearer who became confused or lost could use it to request directions from a dedicated call centre, or to speak two trusted contacts; who in turn could text for their location as a Google map. With safeguards, she believed this could help many vulnerable people remain both independent and safe. We also heard about a couple who had gained peace of mind with installation of a doorway sensor, so that the wife would no longer be worried she would sleep through her husband’s night-time wandering. The devices currently on offer are a mixed bag. There was an environmental remote control to operate lights and draw curtains, potentially of use to someone who is bed bound. There was a medication dispenser, as complex and fiddly as a Rubik’s Cube, but potentially useful where there was a carer who had the time and skills to learn and manage its operation. Not all of it was high tech – perhaps the most well received bit of kit, by both professionals and older COBALT project participants – was a key safe with a simple four digit combination that would allow a care worker or family member to get into someone’s house in an emergency. A key finding of COBALT is that age isn’t a barrier to using technology; however people tend not to value or keep using devices unless they can easily learn their operation by playing with them. The potential of mainstream technology became evident when we heard Brian’s inspirational story. When he was diagnosed with dementia Brian lost his confidence with devices as simple as the TV remote control. However since participating in COBALT he has learned how to use tablet computers and smart phones, enriching his life and enabling him to be independent when it comes to tasks such as booking travel. He says: “I am proof positive that new skills can be learned, especially with new technology.” You can find out more about Brian on his blog. Age Scotland’s new partnership with Action on Hearing Loss and RNIB is enabling us to encourage use of technology to improve quality of life for hearing or sight impaired older people. At ourEdinburgh Nicolson Street shop you can see what’s on offer (see picture). We’re hoping to roll this out to more of our shops, starting very shortly with Bathgate. Doug Anthoney is Age Scotland Communication and Campaigns Officer. You can also visit our Edinburgh Nicolson Street shop on Facebook.